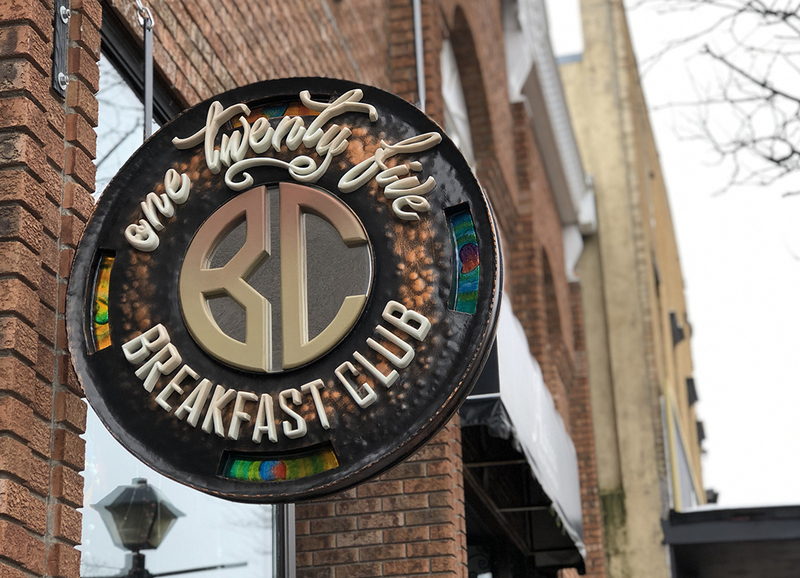 On our recent getaway to Orillia, we walked up the street for breakfast, to 125 Breakfast Club. Think Coras, but with a small town non-franchise feel. The fruit may not be cut up into fun designs, but the food is much much tastier, and the service is amazing! This warm and cozy cafe in Downtown Orillia is a perfect example of what you look for in a restaurant: wonderful ambiance, quality food, great service. Owner Angel Brown is so personable. She checks in to see if you are enjoying your meal, and if there is anything else she can get for you (coffee refill, etc). You can tell she takes great pride in not only running her own business, but offering great dishes with quality ingredients, and ensuring her customers are happy. That is the kind of customer service that would be hard to find at a franchise breakfast stop. The artwork around this cozy cafe is amazing! From 3 dimensional pictures that jump out at you, to beautiful landscapes, all the art is local, and really well done. Like any morning, Wendy like stop start her day with a coffee… the bigger, the better. 125 Breakfast Club did not disappoint there! The girls and I had smoothies. Rachel had strawberry, Lauren had mango, and I had matcha. Lauren’s face lit up when she saw Unicorn Pancakes on the menu, so she just had to get them. And was she ever happy she did! Rachel and Wendy both had Bacon and Eggs. The presentation was fantastic! I had the Eggs Benedict. The poached eggs flowed perfectly when cut into, the peameal bacon was on point, and the hollandaise sauce was rich and flavourful. Deliciousness on a plate! 125 Breakfast Club has a full breakfast menu that is sure to please your early morning craving. Give 125 Breakfast Club a Try! Head into 125 Breakfast Club, say hi to Angela, and order the Eggs Benedict. If you are there with kids, have them try the Unicorn Pancakes. Trust me, you won’t be disappointed… with the food, atmosphere, art, and service! Tell her Big Daddy sent you!